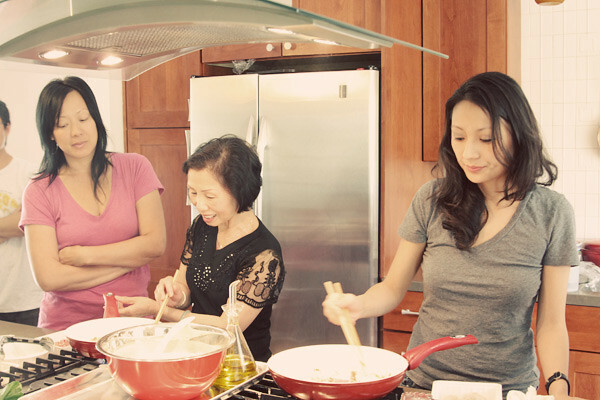 What recipe would you like to learn if you get one afternoon to learn from a Vietnamese grandmother? For us, and some friends, it was crispy banh xeo and Vietnamese egg rolls, called chả giò in the south and nem rán in the north. 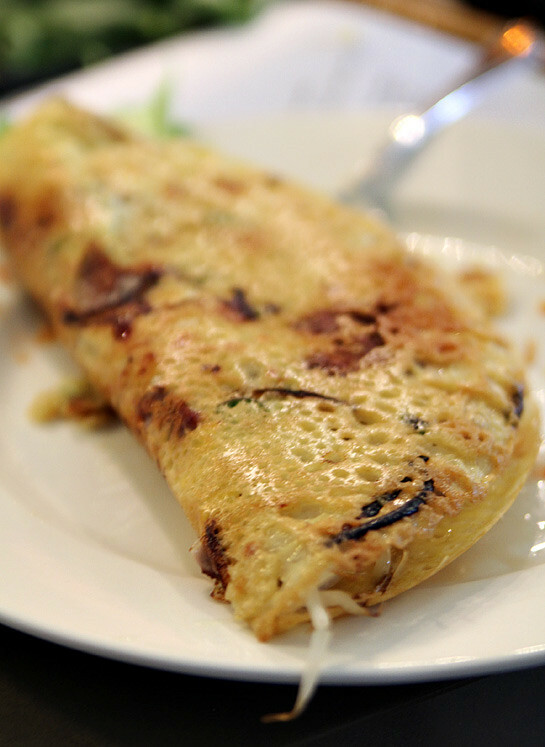 Since we blogged about banh xeo already, we’ll concentrate on the venerable egg roll. How are Vietnamese egg rolls different, than say, Chinese egg rolls? Vietnamese egg rolls are typically wrapped with a rice paper whereas Chinese egg rolls are wrapped a wheat base wrapper. They both contain a variety of chopped vegetables and can be made with pork, shrimp, or leaner meats such as chicken or turkey. The textural differences between rice paper and wheat paper is stunning. 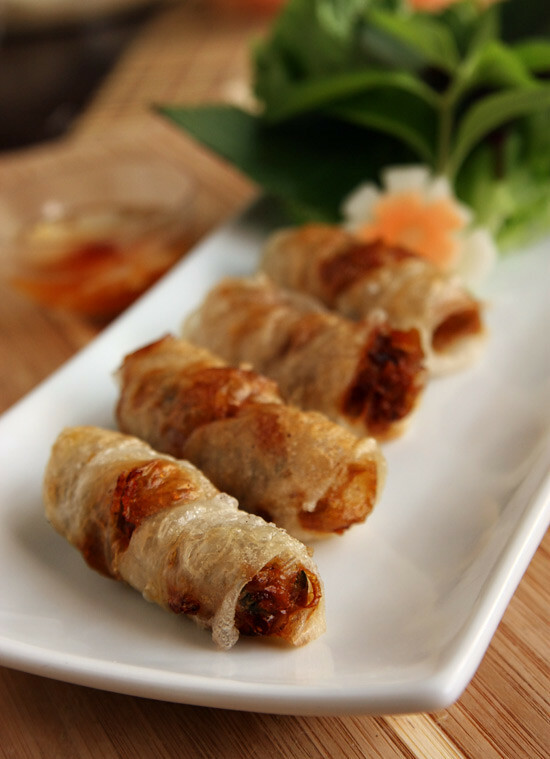 The rice paper roll is both crispy, bubbly and pleasantly chewy, a great alternative to the wheat based wrapper. Hong’s parents have been making Vietnamese egg rolls for over 20 years in addition to banh cam at their church, raising money for parish activities. So for one afternoon we were all eager sponges, soaking up tips learned from over 40 years of cooking from Hong’s mom, a mother of four and grandmother of two and soon to be three, making banh xeo and chả giò. We’ve previously posted the banh xeo recipe so we won’t comment too much on that here, except to use a good nonstick pan and go low and slow on the heat for crispy banh xeo. But in case you’re wondering, the banh xeo made by all the learners came out delicious! Okay, so now that we’ve tantalized you with banh xeo, let’s get serious about making chả giò. Its harder to find Vietnamese egg rolls made from rice paper these days. The convenience of the wheat wrapper along with even golden brown color makes it an easy alternative. The main reason is that rice paper is a little tricky to fry and doesn’t get beautifully golden brown like the wheat based egg roll wrappers. When the rice paper hits the hot oil, it immediately bubbles up and blisters. If two egg rolls touch, they will stick to one another. The blistering does calm down after a few seconds, however allowing you to fry as normal. The filling can be any variety or combination of meats described above. Personally we love pork and shrimp together, but any will do. We always use wood ear mushrooms and bean thread noodles but vary other vegetables depending on what we have on hand or convenient at the market. Vegetables we prefer any combination of shredded jicama, taro, or carrots. Bean sprouts are another alternative. Vietnamese egg rolls typically do not contain cabbage. Wrapping an egg roll isn’t terribly complex. However, we didn’t realize some of the reasons why we roll the way we do. Hong’s mom said it’s not just to keep the filling inside, but to also have even layers of wrapper around the filling so it will cook evenly and brown evenly. This is most evident at the ends of the egg rolls, when not wrapped carefully, tends to have only 1 or 2 layers of wrapper so it will cook faster and turns dark or burns while the rest of the egg roll is nice and golden. To avoid this, place your filling on one end of your wrapper paper. Press down each end to form first layer. Crease the bottom, then fold the double layer of wrapper back up, forming 3 layers of paper covering the ends. 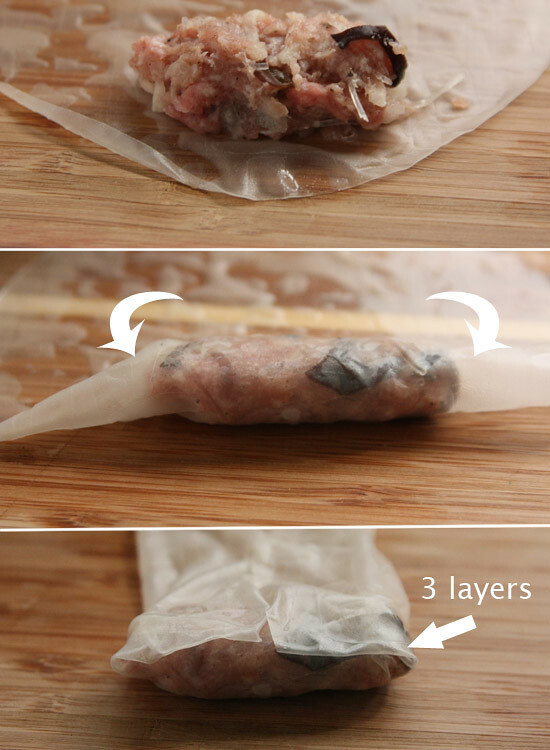 Use this method whether you’re using rice paper or wheat paper. Another trick we learned is that Mom doesn’t use an egg wash to seal the egg rolls. The egg causes a discoloration at the seal and it dirties the cooking oil. 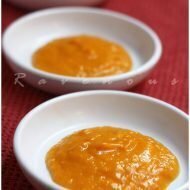 Instead, she makes a simple tapioca starch slurry, cooked to a viscous paste that works like a charm. Enjoy Vietnamese egg rolls with noodles such as bun thit nuong or simply on it’s own, wrapped with lettuce and Vietnamese herbs such as perilla, balm, mint or basil dipped with some nuoc mam cham and do chua. We all had a great time eating, learning, and laughing together. Thank you so much Mom! Mix all ingredients together in a large mixing bowl. Test flavoring to your tastes by microwaving a small tablespoon for about 30s and adjust seasoning to your taste. Any vegetable such as Jicama and taro can be substituted (or omitted) for carrots or bean sprouts. Any type of ground meat can be substituted combined such as chicken or turkey or pork and shrimp. Mix the water and tapioca in small sauce pan on low heat and cook until it thickens to paste and turn of heat and set aside. Place about 2 tbs of filling onto the edge of your wrapper and make one half roll. Crease the ends as shown above, and then fold up the sides. Complete the roll and seal with small amount of tapioca slurry. Fry in small batches at 350 degrees until golden brown. Place on cooling rack. Note: Rice paper will never brown as nice as wheat based paper. If using rice paper, fry only a few at a time, do not let them touch or touch them for the first minute. My girlfriend and I recently made mozzarella sticks by wrapping string cheese in rice paper and frying it. These wrapping tips will really help out next time. How very lucky you are and everything looks delicious. You have a beautiful family…. What an awesome egg roll primer. I am so book marking this. Its also a wonderful capture of wisdom and insight you just do not get anywhere else. Thank you for sharing. It’s interesting that you call them “egg rolls” – it’s something I’ve only come across in the US as the rest of the world call them “spring rolls”. However you call them, I do think Vietnamese spring rolls are the best I also love to use wood ear mushrooms and bean thread noodles in my filling. Your recipe looks very similar to my mum’s recipe so I’m sure it must be delicious! Question for you. A girlfriend tells me that she doesn’t care for the Bac styled cha gio because bean thread noodle is included. She tells me that traditional nam styled cha gio does not include it. Is there any truth to that? For many of us, finding ingredients, such as taro, wood ear mushroom, and tapioca flour, is an insurmountable challenge because of where we live. I would welcome an alternative recipe that approximates your results but uses more common ingredients. What could I substitute for taro? And tapioca flour? By the way, I found your blog via the Christian Science Monitor. Good work! you can use jicama, carrots, or bean sprouts. not sure what would be substitute for woodear mushrooms but it’s commonly found in any asian market or finely mince shitakke mushrooms. if you don’t have tapioca flour, just use egg wash as a sealant. I have never been a fan of the rice paper version. I guess growing up eating the wheat wrapper just has been preferred. I just think the rice paper version is just so much more chewy. We recently made it with ground turkey and I have to say that I think I prefer it with that over the ground pork now. But I think we need to make it a couple more times just to make sure that is more preferred. But we have made it with cabbage before just not too much of it. I think I am going to have to get my mom to make some next weekend. We had just stocked up on the wrappers on last weekend trip to the Asian store. There is this Vietnamesse place just outside DC called “Four Sisters” that my family goes to all the time and we LOVE the egg rolls there. I can’t wait to try this recipe at home, hanks so much for sharing! 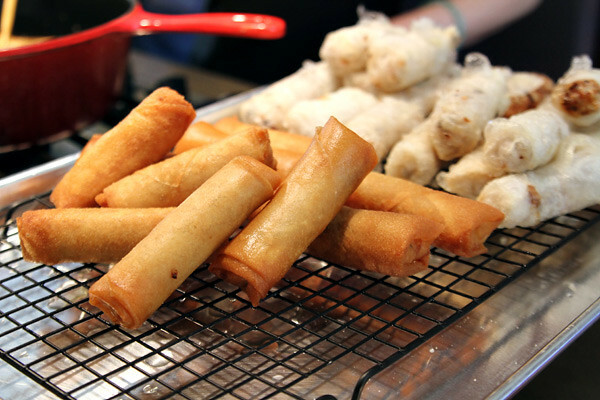 I’ve cooked different kinds of eggrolls or spring rolls, vietnamese rolls or Filipino “lumpia”. Tried and tested different kinds of vege and meat and tofu. The best I’ve used so far is a combination of ground chicken and chopped shrimp. For vegetables, I used shredded jicama (it’s crunchier unlike taro and carrots), chopped green onions, bean thread noodles, chopped onions and garlic. Used oysters sauce, chicken granules and ground pepper. Used boiled water and cornstarch to seal. Boiled water and flour is also a good substitute. Egg whites and water is another substitute. For vietnamese rolls dipping sauce I used fish sauce, sugar, vinegar and water. Wrap in lettuce with mint and basil. Enjoy! Ravenous Couple to the Rescue! I just posted about eating in a foreign country and I included photos from my favorite meal in Vietnam. But, I could not remember what the meal was called. Then I went to browse through my bookmarked blogs and your post on Cha Gio came up! I hope you don’t mind I linked to this and a few related posts at the bottom of my blog. I’m going to have to make this at home one day soon! I’m hungry just looking at these pictures. My grandma likes to dip the rice paper in beer in addition to the water before she fries it. I showed her the picture of your t-shirtsand she loves them, especially the heo one. WOW! These look spectacular! I’ve been dying to make eggrolls but haven’t known where to start. Thanks for the inspiration! My co-worker tried to make these using bean sprouts and tofu and I really loved it. It was definitely better than I had anticipated. Great recipe! I could live off the ones at my local Vietnamese restaurant they are SO delicious! I do have a couple of questions about the recipe though, just for clarification. Using 8″ round rice paper wrappers, don’t you soak them first in a liquid and then quarter them before you put in the filling to wrap them? Wow this looks really good. I may make these with that chicken. I have a quick question regarding your Cha Gio. Can they be frozen and taken out and fried at a later date? If so, do you have any recommendations for cooking once they have been taken out of the freezer. These look just like my favorite rolls from the Vietnamese restaurant i love. So much better than chinese egg rolls. I will be making these soon! I have always loved cha gio, since a little kid when my parents would take me to Vietnamese restaurants. However, as I’ve gotten older, I made a decision to remove pork from my lifestyle. Do you have any other filling idea that you would consider “authentic” that I could substitute for pork? 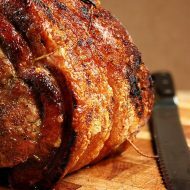 do you cook the meat before rolling? no, it gets cooked when you fry it. Can you freeze the egg rolls either before you cook and take them out of the freezer , thaw and cook them? 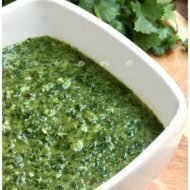 Also, can you give me the measurements to make the fish sauce for dipping? yes! egg rolls freeze really well! I know that you are frying these beauties, but are you pan-frying them in a bit of oil, or deep frying them? Thanks so much! 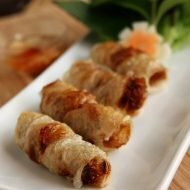 Do you have any tips for making a big batch of eggrolls (wheat wrapper) ahead of time for a party and keeping them crispy?